The Dallas Roughnecks at the 2018 AUDL Championship weekend. Photo courtesy of Matt Messina. The Dallas Mavericks season has come to an end. The Dallas Stars are beginning a much anticipated run for the Stanley Cup. After a soaring start, the Texas Rangers are coming back down to earth. And local football fans are waiting for the Dallas Cowboys selections in the NFL draft and anticipating the 2019 season. Around these parts, this is football country. So, “Are you ready for some ‘sort of’ football?” The Dallas Roughnecks may be just your cup of tea, or beer. 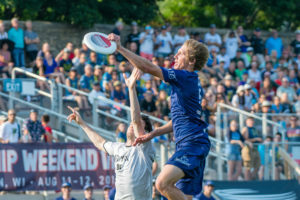 The AUDL consists of 21 teams in four divisions, including franchises in New York, Los Angeles, San Diego, Seattle, Toronto, Montreal, Chicago, Philadelphia, Atlanta, Detroit and Pittsburgh. The teams play a 12-game schedule, and will have an All Star game in early July and playoffs in late July. There are seven players on each side. The objective is to get to the end zone for a point. A player cannot run with the disc, only pass. Dropped or incomplete tosses result in a turnover. Penalties are called, but players are encouraged not to be, well, roughnecks. Teams play on an 80-yard field and matches consist of four 12-minute quarters and a five-minute overtime, if necessary. Players are paid, but most have other jobs. Gerencser beams when he talks about his daughter who captained the ultimate disk team at UT-Austin, which made it to the National Championship. His oldest son also played in college before turning all of his attention to mechanical engineering. His middle son was not as fortunate. Eric, 22, played ice hockey but developed a brain tumor as an 8-year-old. “He was diagnosed with a golf ball sized tumor in his head,” Gerencser said. “He had the surgery, but they didn’t get it all out. He had another surgery and he became paralyzed on one side of his body.” He was rehabilitated and actually got back on the ice. But the tumor returned. At the time, Gerencser was friends with a woman whose mother died of Stage 4 cancer. Eric’s was at Stage 2 during his third surgery. I said, “We are going to do something trying to recognize symptoms early,” Gerencser said. “Stage 2 is alive and Stage 4 is dead. So we started a foundation called ‘Early Recognition Is Critical’ (ERIC). It is all about people speaking up if something is wrong.” He uses his team as a vehicle to promote the ERIC foundation. The Roughnecks opened the 2019 AUDL season on April 5 with a 19-17 victory at home against the Raleigh Flyers. They were tabbed as one of the top three teams in the league in a preseason poll. Dallas won a championship in 2016. “We are the last professional team to bring a championship to Dallas,” Gerencser said.